The Mars Environmental Simulation Chamber (MESCH), developed by a team from the University Of Aarhus, Denmark, simulates conditions on and immediately below the surface of Mars. Thepossibility of life on Mars has been debated almost since the invention of thetelescope. Annualgrowth and shrinkage of the martian ice caps and seasonal changes in color wereobserved by astronomers such as Herschel and Whewell in the 18th and19th centuries. Late in the 19th century, Schiaparellireported the existence of linearfeatures he called canali, and this led to speculation by Lowell(among others) that the Red Planet might host a civilizationmore advanced than our own. The arrivalof instrumented spacecraft, beginning with Mariner IV in 1964, showed acratered, dry, cold planet that looked almost as inhospitable as our Moon; butlater missions provided evidenceof liquid water on Mars in the recent past. This has led to speculationabout whether simple forms of life, like bacteria, might exist on Mars. Thethin atmosphere of Mars does little to block out damaging radiation from thesun, and the surface of Mars seems to be sterilized by caustic chemicals like hydrogenperoxide, but scientists still hold out hope that lifeon Mars could survive protected below the surface. Now,building on a tradition of ground-based simulation that extends back to 1958, anew series of experiments, conducted by an interdisciplinary research team fromthe Faculty of Natural Sciences of the University of Aarhus, Denmark, suggeststhat indeed bacteria could survive beneath the martian soil. The teamconstructed a Mars Environmental Simulation Chamber (MESCH), from which air isremoved with a vacuum pump, and replaced with a thin mixture of gasesequivalent to those in the martian atmosphere. The chamber has a double wallcooled with liquid nitrogen to simulate the cold temperatures experienced inthe martian night. Samples ofsoil in glass cylinders are placed in the chamber's steel sample tubes througha small air-lock, then rotated on a carousel; exposing one sample at a time toultraviolet-rich light from a xenon-mercury arc lamp. Cycling samples throughthe light beam produces a temperature rise and fall that mimics the diurnaltemperature variation on Mars. The atmosphere in the chamber is sampled andsubjected to molecular gas analysis to determine how the soil (and any bacteriait may contain) interacts with the atmosphere. Clifford A.Cerbus is a research physicist with the University of Dayton ResearchInstitute, and has worked for 20 years on a space environment simulation systemat the U.S. Air Force Research Laboratory Materials and ManufacturingDirectorate in Dayton, Ohio. He expressed concern about the high intensityof the ultraviolet light generated by the xenon-mercury lamp used in MESCH,which is approximately 35 times as intense as the sun at Mars' surface. Whilethis enables accelerated testing, in which a few hours in the simulatorsimulates several days on Mars, Cerbus wonders if the results would berepresentative of what actually takes place on the martian surface. "Yes,that is a problem," concedes Professor Kai Finster, a member of the MESCHteam. "We have plans to reduce the intensity by filters to levels morerepresentative of those on Mars. We are also thinking of other light sourcesthat represent a different spectrum and/or intensity, such as a solar simulatoror other types of UV lamps. However, in the first round of experiments we wereinterested in seeing whether we could see any effect at all." So far, theUniversity of Aarhus team has only published results with samples of sand,which demonstrated that the system produces temperature variations comparableto those on the martian surface. However, Finster says that additional testshave since been conducted on samples containing freeze-dried bacteria fromArctic permafrost. Whileexposure to 80 days in the simulated martian environment essentially sterilizedthe topmost two centimeters of the simulated sample core, bacteria were"relatively unaffected" in the rest of the 30 centimeter sampletubes. This result, presented in a paper which is due to appear soon in thejournal Astrobiology, suggests that some form of life could exist belowthe martian surface. 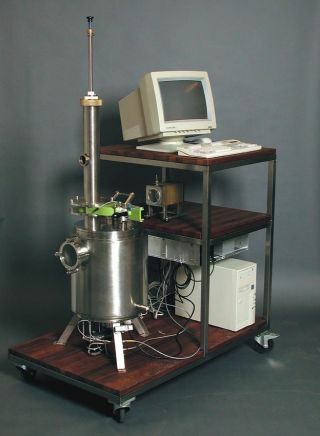 The Facultyof Natural Sciences supported the construction of the MESCH instrument, and theexperiments are supported by the Danish Natural Science Research Council.